What a weekend it was for some teams. Not all of them, there are a lot of them that really aren’t worth even mentioning. 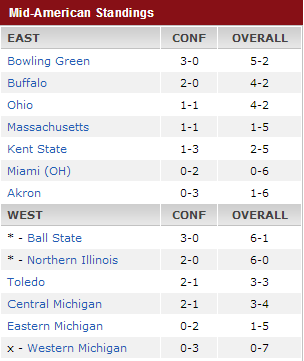 Either way, it was a Saturday full of football this weekend, and the MAC gave way to a lot of interesting storylines. It all kicked off with Eastern Michigan taking on Army, and in a 50-25 loss they were a part of history. Army’s Terry Baggett ran for 304 yards, setting the Army record and having the most rushing yards by one player thus far this season. It’s the wrong side of history, but it’s history nonetheless. The saying is no press is bad press after all. There was only one blowout this week in a conference match-up where Buffalo took care of Western Michigan 33-0, effectively disqualifying them from bowl contention this season. Meanwhile Massachusetts beat Miami (OH) 17-10 in what probably should eliminated them. However, both teams live to fight another day and compete for a coveted bowl game. At least until next week, that is. Close contests rounded out the week in MAC football, where the Central Michigan Chippewas edged out a 26-23 victory over Ohio, Ball State took a 27-20 victory over Kent State, and 23-ranked Northern Illinois defeated Akron 27-20 to take their home win streak to 23 straight. Perhaps the best of all, though, was Bowling Green nearly taking the upset over SEC foe Mississippi State despite ultimately losing 21-20. Offensive Player of the Week: Colin Reardon, QB, Kent State Golden Flashes. This freshman starter was lights out this week against Ball State. He went 19 of 24 for 166 yards and 2 touchdowns. It doesn’t matter that he threw an interception, because he was able to counteract that error with his incredible playmaking ability. He had nine runs for 71 yards, and by the end of the game had his highest QBR of the season by far at 83.1. Defensive Player of the Week: Khary Bailey-Smith, DB, Massachusetts Minutemen. It may have been against a terrible offense, but that doesn’t take away from the fact that Bailey-Smith was everywhere. He managed to have 10 tackles, which is extremely abnormal for a defensive back. Not only that, he had two of his team’s three interceptions on the evening, returning one for 25 yards. He was a key contributor to the defense in holding Miami’s starting quarterback to an 8.8 QBR, 10 points, and their continued winless streak while giving Massachusetts their first win to match their total from last season. Goat of the Week: Travis Carrie, CB/PR, Ohio Bobcats. Oof, this is a rough one for Carrie. He had a solid game going for him, matching his season high in tackles at 6. However, he ended up with his first game since the opener without a pass defended and made the biggest mistake of the game with the chance to seal victory for the Bobcats. Fumbling a punt return on your own 39 in front of the Homecoming crowd, it’s going to be a tough week for Carrie. 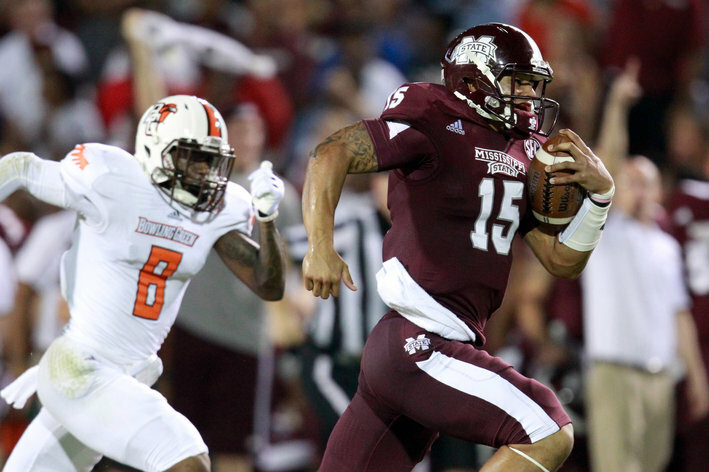 Game of the Week: Bowling Green at Mississippi State. How often do you get to see a MAC school nearly take down an SEC team? It doesn’t matter how good the SEC team is, which in this case they’re considered average at 3-3, it just matters that it’s the SEC. Bowling Green took a big time school to the brink, and nearly won the game, if only for that one point. Maybe they should have gone for two on their last touchdown? They would’ve only been down by two had they done it, still in need of a field goal to take the lead. Either way, the Falcons were tough and helped promote the MAC as a tough conference. Game to Watch: Massachusetts vs. Buffalo. Buffalo has been on a hot streak, and I’d like to think that I called it after their offensive explosion against Connecticut. They’re a tough team, but streaky, and could end up barely bowl eligible, or undefeated for the rest of the season. They’re producing an average of over 38 points in their last three games, and on a four game win streak, they’ll try to keep it going against Massachusetts. The Minutemen beat Miami, and could come into the game feeling good. However, if they have to rely on double digit tackles from defensive backs again, it could turn into a big shootout. No matter the result, the game should be exciting.